The Ethiopian Empire, also known as Abyssinia, in what is now Ethiopia and Eritrea existed from approximately 1270 (beginning of Solomonid Dynasty) until 1974 when the monarchy was overthrown in a coup d'etat. Earlier the Aksumite Empire had flourished in the region, stretching from about the fourth century B.C.E. through until the tenth century C.E. The Zagwe Dynasty then ruled until 1270, when it was overthrown by the Solomonic dynasty. Ethiopia is one of the oldest states in the world, and the only native African nation to successfully resist the Scramble for Africa by the colonial powers during the nineteenth century only briefly succumbing to Italian occupation from 1935 until it was liberated during World War II. In 1896, the Ethiopians inflicted a defeat on the invading Italian army, whose acquisition of territory was confined to Eritrea, to which they added Italian Somaliland. Home of an ancient African Christian Church and with a continuous civilization and cultural traditions stretching back millennia, Ethiopia (mentioned some 50 times in the Bible) became, for enslaved Africans and their descendants in the USA a symbol of black pride and dignity. In the twentieth century, the last emperor of Ethiopia took on special significance for many people of African descent as the Messiah who would lead them to freedom from oppression. Against the European-North-American stereotype that Africa has had no civilizations of its own, and required a supervising, helping hand from the colonial powers to progress and develop, here was at least one example of an ancient nation-state that, although not in its current constitutional form, pre-dates many European states. It was, however, pride in his lineage and his autocratic bent that led to the last emperor’s downfall. He had moved towards constitutional monarchy but his apparent indifference to the suffering caused by famine between 1972 and 1974 resulted in a Marxist-coup. Human settlement in Ethiopia is very ancient with earliest ancestors to the human species discovered. Together with Eritrea and the southeastern part of the Red Sea coast of Sudan, it is considered the most likely location of the land known to the ancient Egyptians as Punt whose first mention dates to the twenty-fifth century B.C.E. The beginnings of a state were evident in the area that would become Abyssinia by 980 B.C.E., which also serves as its legendary date of establishment. This date may have more to do with dynastic lineage than the actual establishment of a state. The Zagwe dynasty ruled Ethiopia from the end of the Kingdom of Axum at an uncertain date in the ninth or tenth century to 1270, when Yekuno Amlak defeated and killed the last Zagwe king in battle. The name of the dynasty is thought to come from the Ge'ez phrase Ze-Agaw, meaning "of Agaw" and refer to the Agaw people. Its best-known king was Gebre Mesqel Lalibela, who is given credit for the rock-hewn churches of Lalibela. What is now Eritrea was conquered by the Umayyads in 710 but traditionally Ethiopia was considered to be exempt from Muslim attack because of the hospitality that Muslims had enjoyed there during the life-time of Muhammad. This may well have enabled the kingdom to survive as a Christian state surrounded by Muslim polities. David Buxton has stated that the area under the direct rule of the Zagwe kings "probably embraced the highlands of modern Eritrea and the whole of Tigrai, extending southwards to Waag, Lasta and Damot (Wallo province) and thence westwards towards Lake Tana (Beghemdir)." Unlike the practice of later rulers of Ethiopia, Taddesse Tamrat argues that under the Zagwe dynasty the order of succession was that of brother succeeding brother as king, based on the Agaw laws of inheritance. The number of kings of the Zagwe dynasty is uncertain: Ethiopian King Lists provide from five to 16 names belonging to this dynasty, who ruled for a total of either 133 or 333 years (other possibilities include 137 years, 250 years, and 373 years). All agree that the founding king was Mara Takla Haymanot, son-in-law of the last king of Axum, Dil Na'od. However the name of the last king of this dynasty is lost—the surviving chronicles and oral traditions give his name as Za-Ilmaknun, which is clearly a pseudonym (Taddesse Tamrat translates it as "The Unknown, the hidden one"), employed soon after his reign by the victorious Solomonic dynasty in an act of damnatio memoriae. Taddesse Tamrat believes that this last ruler was actually Yetbarak. The Ethiopian historian Taddesse Tamrat follows the theories of Carlo Conti Rossini concerning this group of rulers. Conti Rossini believed that the shorter length of this dynasty was the more likely one, as it fit his theory that a letter received by the Patriarch of Alexandria John V from an unnamed Ethiopian monarch, requesting a new abuna because the current office holder was too old, was from Mara Takla Haymanot, who wanted the abuna replaced because he would not endorse the new dynasty. The Last emperor of Ethiopia, Haile Selassie, in 1934, on the eve of the Italian invasion. The dynasty, a bastion of Ethiopian Orthodox Christianity, came to rule Ethiopia on 10 Nehasé 1262 EC (August 10, 1270) when Yekuno Amlak overthrew the last ruler of the Zagwe dynasty. Yekuno Amlak claimed direct male line descent from the old Axumite royal house that the Zagwe's had replaced on the throne. Menelik II, and later his daughter Zewditu, would be the last Ethiopian monarchs who could claim uninterrupted direct male descent from King Solomon and the Queen of Sheba (both Lij Eyasu and Emperor Haile Selassie were in the female line, Iyasu through his mother Shewarega Menelik, and Haile Selassie through his paternal grandmother, Tenagnework Sahle Selassie). The male line, through the descendants of Menelik's cousin Dejazmatch Taye Gulilat, still existed, but had been pushed aside largely because of Menelik's personal distaste for this branch of his family. The Solomonics continued to rule Ethiopia with few interruptions until 1974, when the last emperor, Haile Selassie, was deposed. The royal family is currently non-regnant. Members of the family in Ethiopia at the time of the 1974 revolution were imprisoned, and others were exiled. The women of the dynasty were released by the Derg regime from prison in 1989, and the men were released in 1990. Several members were then allowed to leave the country in mid-1990, and the rest were allowed to leave in 1991 upon the fall of the Derg regime in 1991. Many members of the Imperial family have since returned to live in Ethiopia in recent years. The Imperial Coat of Arms was adopted by Emperor Haile Selassie, and is currently held by his direct heirs in the male line. The arms are composed of an Imperial Throne flanked by two angels, one holding a sword and a pair of scales, the other holding the Imperial scepter. The throne is often shown with a Christian cross, a Star of David, and a crescent moon on it (representing the Christian, Jewish, and Islamic traditions). It is surmounted by a red mantle and an Imperial crown, and before the throne is the Lion of Judah symbol. The Lion of Judah by itself was at the center of the Ethiopian tri-color flag during the monarchy, and is thus the chief symbol of the Ethiopian monarchist movement. The phrase "Moa Ambassa ze imnegede Yehuda," (Conquering Lion of the Tribe of Judah) appeared on the arms, and always preceded the Emperor's official style and titles, but referring to Christ rather than the monarch. The official Imperial Dynastic motto was "Ityopia tabetsih edewiha habe Igziabiher" (Ethiopia stretches her hands unto the Lord) from the book of Psalms. When including the old Axumite rulers descended from Menelik I, and the Yuktanite ancestors of the Queen of Sheba, the Ethiopian Royal House is the oldest in the world along with that of Japan. During much of dynasty's existence, its effective realm was the northwestern quadrant of present-day Ethiopia, the Ethiopian Highlands. The Empire expanded and contracted over the centuries, sometimes incorporating parts of modern day Sudan, and coastal areas of the Red Sea and Gulf of Aden, and extending south toward modern day Kenya as well. Southern and eastern regions were permanently incorporated during the last two centuries, some by Shewan kings and some by Emperors Menelek II and Haile Selassie; though much of the central, and southern regions were incorporated into the empire under the Emperors Amda Seyon I and Zar'a Ya'iqob but peripheral areas were lost after the invasion of Ahmad Gragn. Until the Italian occupation of 1935, Ethiopia stood almost alone on the African map as one of only two independent territories (gray). The 1880s were marked by the Scramble for Africa and modernization of Ethiopia. Conflicts with Italy resulted in the Battle of Adowa in 1896 during the First Italo–Ethiopian War, whereby the Ethiopians surprised the world by defeating the colonial power and remaining independent under the rule of Menelik II. Italy and Ethiopia signed a provisional treaty of peace on October 26, 1896. Defeating a European army was rare enough although not unique in the context of the Scramble for Africa. However, to successfully repulse colonial occupation was unheard of and a considerable blow at the time to Italy's ambitions in the region. In 1935 Italian soldiers commanded by Marshal Emilio De Bono invaded Ethiopia in the Second Italo-Ethiopian War. The war lasted seven months before an Italian victory was declared. The invasion was condemned by the League of Nations, though as with the Manchuria Incident, not much was done to end the hostility. 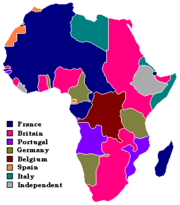 Ethiopia became part of Italian East Africa until its liberation in 1941 by Allied forces in North Africa. In 1951, Eritrea, which had been part of the Italian colonial empire since 1885 and had been administered with Ethiopia from 1935 to 1941, was ceded to Ethiopia by the United Nations on the condition that it would have special status as an autonomous province. In 1961, Selassie unilaterally revoked this arrangement, provoking a 30-year war of independence. Surprisingly, after his fall from power, the Leninist-Marxist regime chose to continue this war, which did not end until 1993 when Eritrea received international recognition as a sovereign state. Although Ethiopia was administered from 1935 until 1941 as part of a colonial administration, this did not enjoy the same legal status as that of other colonies in Africa, since it was considered an illegal occupation by the League of Nations, even though League members did not act on their condemnation. Ethiopia can still be regarded as the only African territory that remained outside the colonial system. In the years before he was deposed, the last emperor encouraged de-colonization with moral and sometimes material support and championed the cause of pan-African unity through participation in the Organization of African Unity and other initiatives. The OAU (founded 1963) was based in his own capital of Addis Ababa where its successor body, the African Union (founded 2002), is also head-quartered. Selassie was the OAU's first Chairman (63-64) and served a second term (66-67). In this manner, the oldest political entity in Africa has grand-fathered some of its youngest entities. Although Haile Selassie moved the empire towards a constitutional monarchy (in 1955), with an elected lower house of Parliament, the emperor and the nobility retained many powers. He was often autocratic when dealing with critics or opponents to his policies, and many peasants felt that they had little say in governance. When widespread famine led to thousands of deaths between 1972 and 1974, the emperor seemed indifferent to his people’s suffering, even claiming that his officials had kept him uninformed. This apparent failure, by an all most absolute ruler, to respond adequately to a crisis that impacted most heavily on the poor, helped to fuel Marxist-Leninist aspirations among certain segments of the population. Marxist sympathizers found a ready audience to hear their vision of a workers’ paradise in which emperors and aristocrats have no place. The famine in addition to the expensive war in Eritrea diverted resources from education and development into the military. In 1974 a pro-Soviet Marxist-Leninist military junta, the "Derg," led by Mengistu Haile Mariam, deposed Haile Selassie and established a one-party communist state. 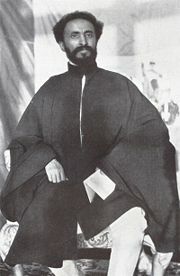 Haile Selassie was imprisoned and died under unclear circumstances, possibly because of being denied medical treatment. This formally ended the Empire of Ethiopia and the end of an ancient regime. ↑ David Buxon, The Abyssinians (New York, NY: Praeger, 1970, ISBN 978-0500020708), 44. ↑ A. K. Irvine, "Review: The Different Collections of Nägś Hymns in Ethiopic Literature and Their Contributions" Bulletin of the School of Oriental and African Studies, University of London. School of Oriental and African Studies, 1985, 364-364. ↑ Taddesse Tamrat, Church and State in Ethiopia (Oxford, UK: Clarendon Press, 1972, ISBN 978-0198216711), 275. Irvine, A. K. Review: The Different Collections of Nägś Hymns in Ethiopic Literature and Their Contributions. Bulletin of the School of Oriental and African Studies, University of London. School of Oriental and African Studies, 1985, 364-364. All links retrieved August 14, 2017. This page was last modified on 28 August 2017, at 19:31.